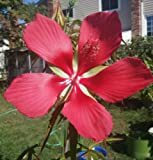 Hibiscus coccineus growing shrub‎ of the genus Hibiscus also known as Scarlet hibiscus, Hibiscus coccineus perennial evergreen plant and used mostly as ornamental plant, can grow in subtropical, mediterranean or tropic climate and growing in hardiness zone 9b+. Leaves color green light to dark in digitate structure (like hand with fingers) there are 5 lobes, each lobe (finger) elliptic shape. Green leaves light to dark in digitate structure (like hand with fingers) there are 5 lobes, each lobe (finger) elliptic shape.